Mousa Ler, comprised of seven villages, is located on the southeastern slopes of a mountain with the same name not far from the shore of the Mediterranean Sea. The terrain is mountainous and the villages are separated by valleys. The roads are rocky and often impassable. While the climate is temperate and favorable for farming, only one quarter of the land is suitable for agriculture. Thus, Armenian villagers tamed the land over the centuries, cleaning the slopes of stones and bushes to plant their gardens and fruit trees. Water wasn’t plentiful and merely sufficed for home garden vegetable plots and to grow fruit trees. Residents would purchase various provisions from Antioch. Locally cultivated fruit trees included mulberry, fig, peach, apple, orange, grapefruit, lemon, larinch (a semi-sour orange whose juice was often squeezed in meals), medlar, quince, plums, apricot, pear, pomegranate, grape, blackthorn, sour cherry, walnut, olive, carob, terebinth, banana and pistachio. Vegetables were planted amongst the trees, thus satisfying the daily needs of local villagers. Each household would plant tomatoes, peppers, potatoes, malanga, carrots, sugar beets, turnips, cabbage, cauliflower, beetroot, spinach, onions, garlic, eggplant, summer squash, gourds, cucumbers, edjour (a kind of striped cucumber, otherwise known as kheta, guta or adjur), radishes, fava beans, green beans, mint, parsley, basil, etc. Cereals were used as well and residents planted wheat, barley, millet, corn, chickpeas, lentils, peas, beans, levous (black-eyed bean), amongst others. Residents would gather wild greens and herbs from the mountain slopes and valleys. These included shepherd’s purse (a member of the mustard family), stinging nettles, thyme, sumac, sorrel, water cress, broad bean, candytuft (Iberis), common mallow, and many others whose names have reached us in the local dialect: erzihoun, tagirag, khanchour, lvag, gatnag khidag, harse madank, henderbil, manikh, mirrag, bakher lizeou (ox tongue), sembek, kerrout. From the carob tree, residents would gather a long bean-like fruit with dark red glassy seeds to make syrup. For honey, people would build basket-like beehives from simple tree branches. The mountain’s rich wild plants (acorns, walnuts, hambalas, laurel, blackberries, wild cherries, etc.) were used to supplement the meager harvests of the fields. The land was rich in wild game and fish, taken from the sea and rivers, provided a daily staple of meat. Fish were also caught for sale. Horticulture and winemaking weren’t that developed. Some people made a semisweet wine for domestic consumption. Raisins were only produced when the grape harvest was excessive. It was exchanged for grains and also distilled into vodka. In contrast to the grape, the fig was a household staple – not so much the fresh fig as the dried variety. Good quality dried figs were sold and the rest distilled into vodka. The same held true for fruit of the orange family. Bountiful harvests were either sold or exchanged for other natural produce. Mulberries were mostly cultivated for the silk industry. For dairy items (yogurt, strained yogurt, butter, cream, fat, cheese) each household had a cow, goat and sheep. It must be noted that fat was used sparingly for nutrition and was only found in the kitchens of the wealthy. Common villagers would use hand-pressed olive oil to cook with, and this is why olive oil features prominently in Mousa Ler cuisine. There were no butchers in the villages. Animals were butchered early in the morning and the meat consumed by night. Meat was rarely used in daily meals where grains and vegetables were the rule. This was the case even though the ghavourma (kavurma) stewed meat dish was common table fare. Meat dishes were mainly cooked for the holidays and wedding feasts, or when respected guests gave to visit and a cow or rooster was slaughtered. Preserves were prepared in the summer. Bread was the staple source of nutrition. A portion of the wheat was made into flour and the rest into bulghur (tsavar in Armenian) after boiling and drying. Rice, shipped in from Marash, was only used to make holiday tanabour. Instead, bulghur (locally called grgiud) made by grinding the dzedzadz was widely used. The famous joke was that people from Mousa Ler ate bulghur for breakfast, for lunch (as a soup), and for dinner (tabouleh). After boiling and drying, the cracked wheat (dzedzadz) is taken to the mill where it is made into coarse bulghur for pilav; medium for tabouleh (grgiudag) and fine for keofteh balls (glor). The finest was called smndrag (semolina); used for making pickling water as well as for prtoudj (hand-sized morsels). 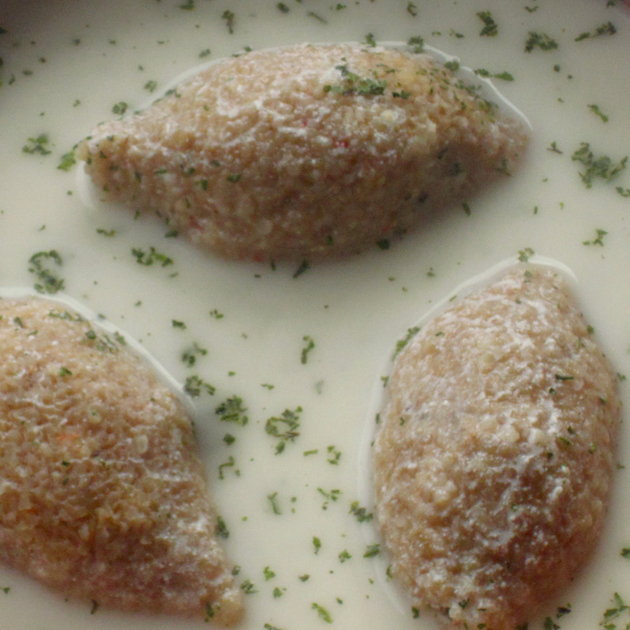 A dish called trkhanou was made of coarse bulghur, cooked yogurt and mint. The bulghur, resting in the cooked warm yogurt all night, would soak in all the yogurt. Next morning, it would be crumpled and dried under the hot sun. Afterwards, it would be encased in cloth bags for preserving. Cheese was a daily staple. Butter was prepared from beating yogurt in the churn, and the remaining tahn was boiled to make curds (choukalig) for cheese. There are three kinds of cheese. Gij or kebdzoudz baneyr: Salt and dried thyme mixed with curds, would be squeezed into a jug for preserving. Initially, the jug would be placed upside down so that the watery part would drain. Sourki: Curds would be kneaded with various spices and shaped into a pyramid in the palm of the hand. It was dried and kept in a glass vessel where it would begin to go moldy. A third type of cheese, khiroubaneyr, was prepared by adding yogurt water to boiling milk. After straining the yogurt, a bit of water was added and it was cooked on a low flame until it went completely solid. This was called ipoudz madzdzeoun (yepadz madzoun-cooked yogurt) and was preserved in small vessels for use in winter soups. Tomato paste (loligi tton) was an essential ingredient of many dishes. A semi-cooked tomato would be strained and then squeezed. The pulp would be cooked on a low flame until solid. The strained bits would be dried under the sun, then crumpled and spiced. Oil would be poured over it and the mixture would be used as a tatsan (gbchaoun-sauce). The most commonly used spice was black pepper, called denuhamim (dan hamemounk-house spice). Also used were cumin, sumac, bahar and cinnamon. Dried greens used in cooking included mint, summer savory and green small flowered basil. The pulp of red hamim (pepper) was pressed in the same way but prepared by leaving it under a scorching sun. Brine was also prepared in the same way (grey colored houroum touti shouroub) that was used as syrup and a medicine. With the advent of winter, the collected and dried seeds in cellars would be roasted and milled together, and the wheat like product (kmmaoun) would be preserved. They would gather and dry the sprigs of a tree/bush called peevig (terebinth, melengiç in Turkish) with grayish-blue oily seeds. As a savory seasoning it was infused in briny olive oil water. 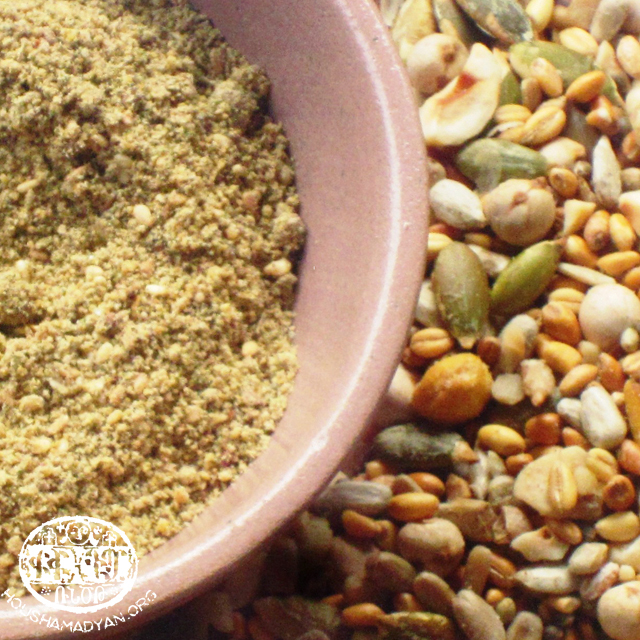 After being toasted and grinded, it was used in grgoudag (tabouleh), prtoudj, and for baking bread. Raw bunches of grapes would be pressed to make aziukh (azokh – the name given to the unripe grapes and the pickle juice made from them). To make raisins, the grape clusters were dipped into ash water and then hung in the sun to dry. A concentrate was made from the juice of orange blossoms, and jam from the orange peel. Mousa Ler was rich in olive trees and olives always appeared on the table. In the fall, green unripe olives would be gathered and after washing for a few days would be cracked (buhttuhtsnel) with special wood mallets. The olives would then be preserved in brine. Olive oil was made from black ripe fruit pressed in a machine called a patoz (village stone press). Boiling water was mixed in and the batch was pressed by hand. The oil would rise to the surface where it was spooned off and placed in bottles. Fruit was dried, especially figs. Syrup was also made from grape juice. Sometimes, datla (jam) was cooked in the grape syrup. 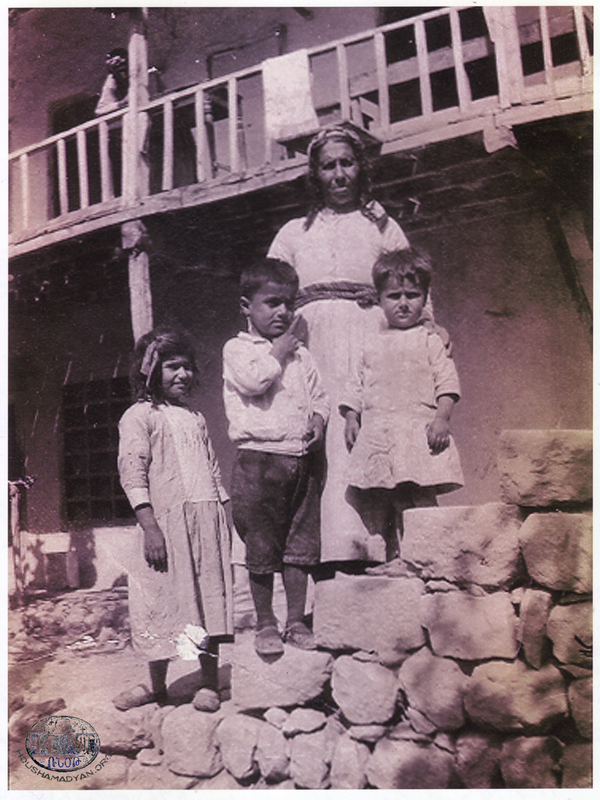 Armenians of the region called bastegh (fruit paste) mlbee. Vegetables left over from the winter sowings were made into tourshi (pickles). Bread was baked twice a week in a tonir. These underground ovenswere built in the courtyards and were often shared by several neighbors. In addition to the common tonir bread made with yeast, there was also a bread (pagharch/dzepuh houts) variety without yeast prepared on a sadj (an acorn-shaped oven about as big as a breadbox) often called dzoup, from which the bread gets its name. There were also other daily and holiday bread varieties – banuruhouts, gatnuhouts, chiftuhouts, tatsunnuhouts, gatnupigit, tsitupigit and ourourough. Fireplace: Women would fire the odjakh (hearth) with clay brought from the mountain passes. It had three pinnacles since the saying was – tandjaran uhrk karen guh nsta (The pot sits on three stones). For winter, there was a furnace in the house. During the rest of the year, food was cooked on the fireplace in the yard. Different sized glass bottles and jars, called katramiz were used for canning. Also used were clay pots, jars, jugs and pitchers. There were spaces in the walls to keep pots and other vessels used daily and for canning. Kitchens had copper pots of various sizes whose lids were used as plates. There were various sized metal and wooden serving trays (sini), pans, basins, sieves, tsiruhmough (wheat sieve), etc. It should be noted that the copper pots were plated every year. There was a special round utensil braided from straw called daboukh to serve bread and fruit. Making kitchenware was a common trade in Mousa Ler. Thus, there were many sizes and shapes of spoons, ladles, rolling pins, mallets and bowls; all for different purposes. To make dried fruits, people used mats called himkeh. Bushes would be pressed under heavy tree stumps and flattened to make the mats. The household table was braided from wheat stalks. The low table, around which people would sit cross legged for meals, was called a doufra. They’d sit on pillows (mindar) stacked on the carpet (khsir – a mat braided from a type of reed). Tugh ehnno ku gokq,chotsur eirgenq durzan ni kidank. Teon zmeer houts deor isour. Choutsur kee munkul mikeldotsn uzbardkiur guh beghshishunk. Salt used in Mousa Ler was brought from Antioch. They mostly used coarse salt. Fine salt, for the table, was crushed by the housewife with a havank (mortar). Salt was a sacred item from olden times. As in all Armenian regions, the concept “salt and bread” was an internal and obligatory principle. It wasn’t by accident that when residents selected a girl as a family bride, a certain amount of salt was placed in the salt shaker. As it was being consumed, the family would follow the goings on in the house, thus predicting the girl’s impact on their household. Mix ingredients together. Sourki (moldy cheese) prepared in summer. Grease hands and roll into pyramids. Place on cotton cloth and put in shady and windy spot. Let dry, occasionally turning over. After drying, to make moldy, place in glass pitcher, close opening and store in dark, cold place. It will go moldy in time. To consume, clean off mold, cut in thin layers and add oil. To avoid mold, keep in refrigerator. Chop onion; add to sourki. Add oil and spread mixture on bread dough and bake in oven. *To make bread dough – Add ¼ cup oil to 1 cup lukewarm water; 1 teaspoon sugar; ½ teaspoon salt; 2 teaspoons yeast and 2-3 cups flour. After kneading, cover and wait two hours. Finely chop onion and olives (use electric mixer). Season and add oil and parsley. Spread mixture on bread dough and bake in oven. This bread, along with usual bread was baked on holidays. The cream from milk was gathered and the dough kneaded from the same milk. Special kata patterns were made before baking. Afterwards, the cream was rubbed on the bread. Harsuh Trakhuh (Harsi Katah) was made the same way, but in smaller measurements. It was handed out to in-laws. Mix milk and honey; add flour, mahleb and yeast. Knead until dough is soft. Let rest a few hours to rise. Prepare a few round loaves, embellish, and bake. Immediately after removing from oven, rub with milk cream. Mix the fat and sugar; add eggs and beat. Then add milk, yeast and spices. Add flour a bit at a time and knead till soft but not sticking to hands. Let rest for a few hours to rise. Cut into small pieces and roll into balls, braids or clumps. Brush with eggs, sprinkle sesame seeds on top and bake. Knead dough and make into balls. Let rest for 30 minutes. Then roll dough into thin, lavash-like layer, brush on oil, turn over on self, and fold into sphere. Make designs with a fork and bake. On the holiday of St. Sarkis, people would make a special pastry called koumbou, in which a michink (coin charm) was placed. This was prepared for Lent, without oil, eggs and milk. Lightly roast flour and let cool. Sieve flour, mix in sugar and spices and knead with oil/water mixture. Add chopped nuts and raisins and mix. Place dough on pre-oiled/floured oven dish. Even out with damp hands and sprinkle sesame seeds on top. Bake in medium then low heat for 30-40 minutes. 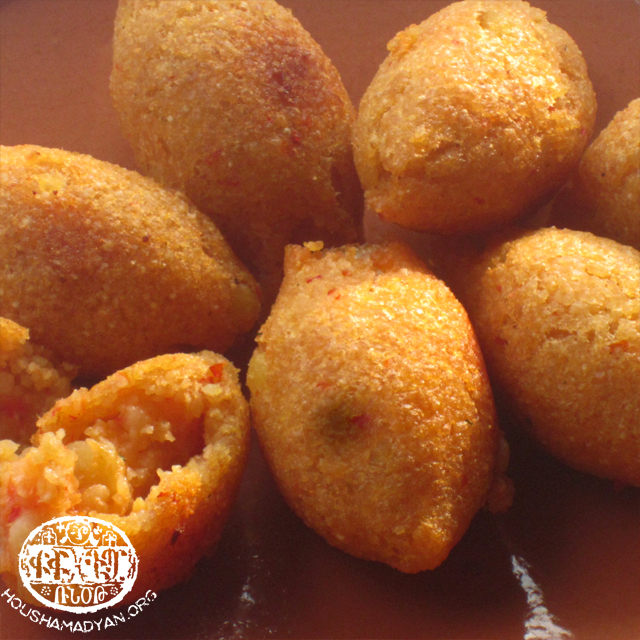 There are two types of fried pastries in Mousa Ler cuisine. Knead the dough and shape into walnut-size balls. Roll dough balls into very thin layer. Add walnuts and cinnamon core. Roll and then fold two edges into snail-like shell. Pinch the two edges together and fry in oil. Remove after a few minutes and place in sugar water for five minutes. Then place pastries on mesh sieve (souzag) to allow excess sugar water to escape. Mix ingredients to get weak dough. Lift with spoon (thus the name of the dish tkalag; spoon in Armenian) and drop in hot oil. When color changes after a few minutes, remove from oil and immediately place in sugar water for five minutes. Then place on a sieve for excess sugar water to escape. A jam called datla was made from orange peels. To make this jam, grape juice or syrup (used as a substitute for sugar powder at the time) wasn’t used. Instead, they just used dried orange peels in the shape of a wick and cooked them. To make mlbee (bastegh), boil very ripe fruit in its own juice, pass through sieve, then boil again. Then spread over serving platters lightly coated with oil. Dry under hot sun. Then either cut or roll over and keep in a cold, dark place. Peel oranges in layers and then fold over to look like a wick. Use needle to thread the peels one after the other and hang in a cool place to dry. Before cooking, place in boiling water and let water drip off to remove the bitterness. Prepare the sugar water, boil, and pour peels inside. Cook in stages on low heat. Toast flour in fat or oil until golden. Knead with honey water or syrup. Then shape into morsels. Boil milk with cinnamon stick. Add sugar and bulghur and cook until liquid dissolves. Lightly toast flour in fat. Add hot milk and constantly mix until uniform. Add salt or sugar (or both). Beat eggs with flour and pour into hot fat. Cook both sides. Pour honey on top to serve. Chop greens, beat eggs and flour, and season. Heat oil. Spoon mixture on hot oil and fry both sides. The same method is used to prepare summer squash ehdjdjeeg, especially the day after making dolma, in order to use the core of the squash. Add cut tomato and pepper to fried onion. Season and then break eggs on top. Cook according to preference – omelet style, sunny side up, etc. Fry meat and onion together in fat and season to taste. Add beaten eggs and cook. Shepherds had their own special dishes. 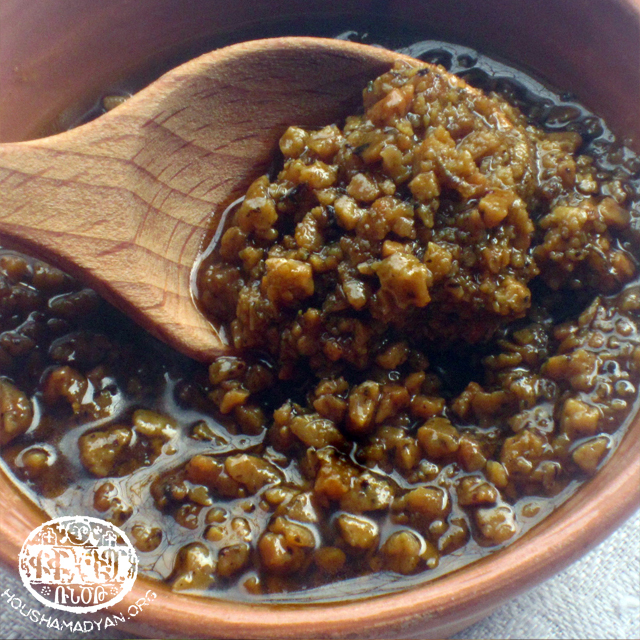 The most common was simple talamou, prepared from the fig milk gathered from the broken ends of fig tree branches. It was mixed with hot pressed sheep milk that would immediately break into pieces. There were several salad-like dishes called pezurgani that shepherds would make in the open fields with produce brought from home that morning. Dice olives, tomato, onion and greens. Add chopped walnuts, paste, oil and pomegranate pickle. Season to taste. Dice sourki and place in center of plate. Drizzle oil on top. Chop veggies and place next to cheese. Salads were very simple. Salt, oil, lemon or vinegar and spices were added to the main ingredient. Sometimes, fresh, chopped greens were also added. Cut cabbage into thin, long slices. Add salt, red pepper, mint, sumac, garlic, oil and vinegar. Add chopped onion, parsley, red pepper, lemon juice and oil to beans. Finely dice tomatoes, add one chopped onion and pepper, parsley, mint and season with red pepper. Add lemon juice and oil. Cut lettuce into thin strips. Dice green onion. Season with red pepper and mint. Add oil and vinegar. Cut boiled potatoes into small cubes. Chop onion, parsley and mint (sometimes one tomato and pepper) Season with cumin and red pepper. Add oil and vinegar. Cut plenty of onions. Add 1 small tomato (finely diced) and parsley. Season with sumac, cumin, and red pepper. Add lemon juice and oil. Add paste, spices and water to fried onions. Add bulghur, cover and let cool. Dice greens and mix into bulghur. Add lemon juice. Serve with boiled cabbage, lettuce leaves or with fresh grape leaves. The word prtoudj means a long morsel shaped in the palm of the hand. It was a daily staple and potato prtoudj was especially prepared on days of collective work; for example when women gathered to make tomato paste, cooked yogurt or syrup. Boil potatoes, drain and mash. While still hot, pour over bulghur and knead. Add fried onions (or diced raw onion), yogurt and seasonings. Continue to knead with wet fingers. When ready, mix in diced tomato, pepper and greens. Shape into prtoudj and serve. First prepare filling – Boil potatoes and mash, then add fried onions, paste and seasonings. Let cool. Prepare dough – mix bulghur to hot potatoes. Then add remaining ingredients and knead by adding water a bit at a time until dough becomes soft but not sticky. Remove walnut sized pieces, knead gently and open hole with fingers and widen. Then add filling, close, and shape into a lemon. Fry in plenty of hot oil. First prepare filling – Cook diced onion and ground meat with spices. Let cool. Prepare dough by mixing ingredients and kneading with wet fingers until soft but not sticky. Remove walnut-sized pieces, open hole and widen with fingers. Then add filling, close, and shape into a lemon. Fry in plenty of hot oil, or cook in yogurt soup. To make yogurt soup – boil 1-2 spoons rice in boiling water. Then add yogurt. Use powered mint. There was also a dish of raw meat prtoudj – Fresh red fat-free meat would be beaten on a stone mortar. It was then kneaded with fine bulghur and hot red pepper paste. The raw prtoudj would be dipped in cooked meat (with seasonings and onions) served alongside. There was also a dish called ichaghiov klour. The dough shell is made by kneading in the same manner for the meat klour. However, the filling is made from beaten fat (animal innards) and then mixed with hot red pepper. It is then shaped into nut-sized balls and filled inside the dough balls. Cook in tahnabour. Seenragha is a flat variety of the same meat balls prepared in a seenee/platter. Trak are the round flat balls (10-15 centimeters in diameter) that are grilled. This dish is unique to Mousa Ler. Tsoutunnuh trakug is the daily consumed meatless dish. Mix trak ingredients, knead with water and shape into 2 centimeter coin-shaped flat balls. Boil in salty water until the balls float to surface. Add paste, diced tomato and veggies atop fried onions, season and cook. Then add trak to sauce and boil once again before serving. Soups, rich in grains, were widely consumed during the winter. Of note are the soups prepared with the peculiar combination of cooked yogurt and tomato paste. Boil cracked wheat. After it cools add the yogurt-garlic, or than. Sprinkle with mint. Dissolve cooked yogurt in boiling salt water. Then add cracked wheat and boil. Finally, add mint and serve with butter, according to taste. Cut and boil vegetables. Add paste, spices and greens. Serve with stale bread. Boil lentils; add bulghur, fried onions and spices. Add lemon juice as final step. Agunchig is a dough ball filled with meat that’s cooked in soup. The name derives from the shape of the dough. 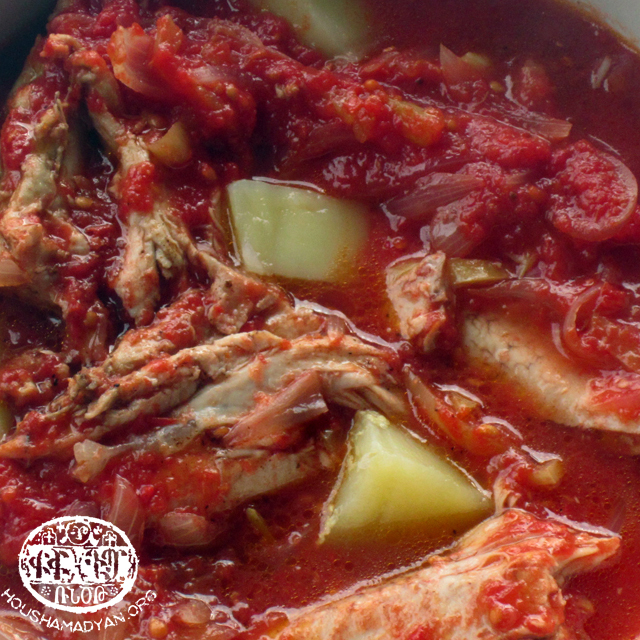 There are two types for the soup in which the dish is cooked – yogurt soup or a soup fashioned from tomato-pepper paste mixed with garlic, lemon juice, mint and hot pepper. Fry the meat with the onions and spices. Knead dough, roll out thinly, and shape with the edge of a coffee cup. In each ball add a little meat and fold over to form a half moon shape. Then pinch edges together into an ear shape. Line them up on a tray and cook for a few minutes in a hot oven until slightly brown. 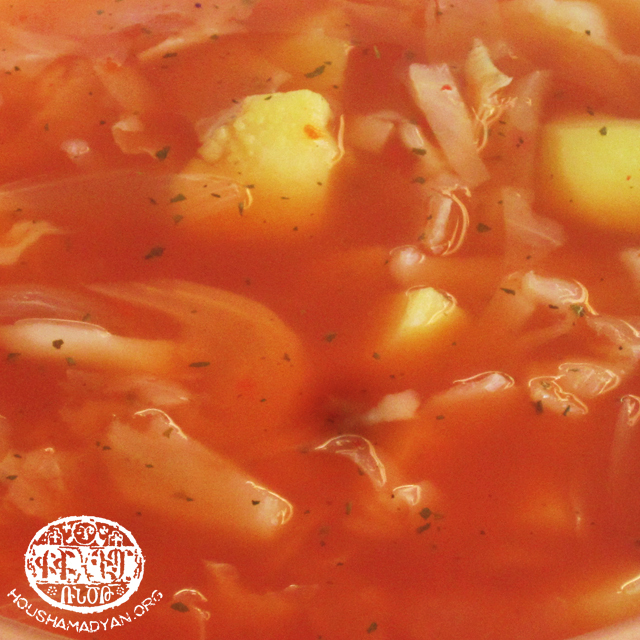 Prepare yogurt soup (or tomato paste soup) and place little “ears” in the soup to cook for a few minutes. Serve. Cook lentils. Knead flour and bulghur with water. Shape small balls and fry. Add balls, chopped greens and potatoes to lentils. Heat tomato paste and crushed garlic in same oil and add to soup. After turning off flame, add lemon juice and mint. Cook grain in plenty of water. Add pepper paste, garlic, walnuts and spices. Various soups and pilaf dishes are made with tuhrkhanou. Different vegetables are used for summer tarkhana* soups – carrots, potatoes, summer squash, onions, tomatoes and green beans. The winter tarkhana soups contain grains. Tarkhana can be substituted by adding coarse bulghur and cooked yogurt (or sour cream) to the soup. * The tarkhana is a mixture of flour, farina, yogurt, milk and eggs, that is made into dough and then dried. The dried pieces are then crushed by hand, passed through a sieve, and kept in jars until needed for soup. Cook chopped vegetables. Add bulghur, chickpeas, beans, paste and spices. Add fried onions and cooked yogurt to the meal. Cook another five minutes. Cut up malanga and cook. Add cooked yogurt, tomato paste, fat, chickpeas, spices, and cook. While turning off heat, add lemon juice and garlic. Can also be prepared with meat. Serve with bulghur or rice pilaf. Duhryee is a holiday macaroni dish. Knead dough from flour and eggs. Then roll out to thickness of 1 centimeter. Cut into layers and cook in boiling soup. There is also a dish called shghayree, which is made by kneading and crushing dough with the fingers. Boil water and add paste and macaroni; let cook. Add chickpeas and cooked yogurt. Heat garlic and mint in fat. Add to soup and while turning off heat, add lemon juice. Add cuts quash to fried onions. Then add watery paste. When the squash softens, add the legumes. Season, add crushed garlic and lemon juice and turn off heat. In the Mousa Ler dialect, pilaf is called aber. There are many pilaf dishes – with potato, cabbage, luhvous (black-eyed beans), wild veggies, green beans and fava beans, etc. Lightly brown vermicelli in hot fat. Add bulghur and mix. Add water, paste, chickpeas and spices. Cook on low flame until water completely is drawn. Chop and cook greens. Add spices, drained greens to fried onions; then add bulghur and cooked greens’ water. Cook on low flame until water is completely drawn. This pilaf is unique to Mousa Ler. 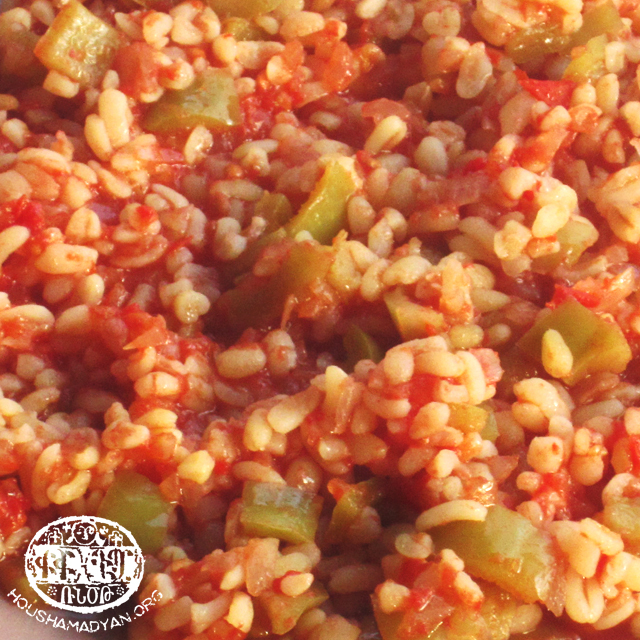 Frequently called khdra or pousdan (posdan/garden) pilaf. Cook chopped beans. Then add, in order, the pepper, potato, squash and tomato. When vegetables are cooked, add bulghur. Cook on low flame until water is drawn. Fry cut onion in fat and add to pilaf. Add chopped pepper and then tomato to fried onions. Semi-cook veggies and then add bulghur, water and seasonings. Cook until water is completely drawn. Cut up chicken and cook. Completely remove water of the first boil. Then add fresh water and continue cooking. Add tomato paste, chopped onion, chickpeas and bulghur and cook on low flame until water is completely drawn. Soak tarkhana in boiled water until tender. Add tarkhana top fried onions and season. If necessary, add extra water and cook on low flame. Dice, cook and drain greens. Add to fried onions. Fry and season and then add water in which the greens were cooked. Add bulghur and cook. When turning off flame, add lemon juice. When grandmothers were busy with household chores and not able to cook dolma, they would take all the ingredients, place them in a pot, and cook over a low flame. Hence the name of the dish – puhlludoudz (pladz-collapsed) dolma. Cut up vegetables; add bulghur, oil, paste and spices. Pour enough water into pot to cover ingredients. Cook on low flame until water is drawn. Grind the meat, dice the tomatoes, pepper, garlic and herbs. Mix in bulghur and spices. Scoop out vegetables and fill. Cover bottom of pot with mint leaves. Add enough water to cover veggies and cook on low flame until done. After removing coarse parts of leaves, place for a minute or two in boiling water to soften for folding. Prepare filling by slicing onions, garlic and herbs, Mix in cracked wheat, oil, paste and spices. After folding, place the “cigars” in a pot, Add enough water to cover. Cook over low heat until water is drawn. Let cool before removing. Mandjig is a semi watery meal served with pilaf, or eaten with bread crumpled on top. It can be prepared with various greens or vegetables, often together. Cut eggplant into cubes and fry in oil until tender. Add chickpeas and tomato paste dissolved in water. After cooking, add spices and garlic. Slice beans and steam with oil until slightly yellow. Add sliced onion and pepper and continue to cook on low heat. Then add tomato and garlic. Season and cook until done. * Various mandjig dishes can be made the same way with broad beans, okra, summer squash or potatoes. When using mixed vegetables, add all the above vegetables together in the mandjig and cook. Cut up onions and liver and fry. Add paste and spices. Cook covered for 10-15 minutes on low heat. In Mousa Ler cuisine, tatsoun (tatsan) dishes are sauces eaten by spreading on bread or by dipping the bread in. Grind all ingredients separately. Mix and season and store in glass jars. When serving, remove an amount and dribble with oil. A tatsan made from cooked yogurt is another variation that grandmas (neneh) made for their grandkids. It’s a spread for bread. Add spices to fried onions. Then add cooked yogurt dissolved in a bit of water. After boiling, mix in crushed garlic. Slice or grind dried tomato. The season and add oil. Serve as a dipping sauce. Harisa made with meat was not a common daily dish. Harisa made with rooster meat was prepared for special guests. When served on holidays or at weddings, it was made from mutton. There are also varieties from Lent and daily fare, when the meat is substituted with cabbage, potatoes or walnuts. 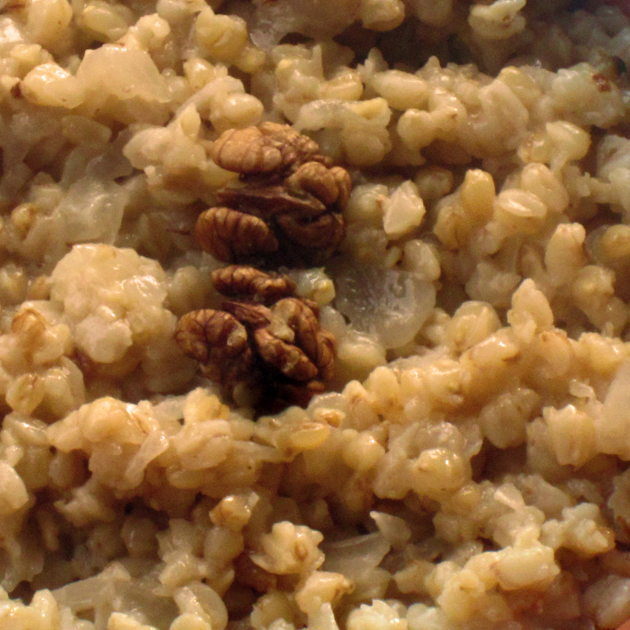 Cook cracked wheat; add sliced walnuts and fried onions. Continue cooking over low heat, stirring constantly until white. Serve with spices. Hunting for wild birds was commonplace. The meat of small fowl was grilled. If a large bird was killed, the tough meat was used to cook a special khashlama called duhbbou. This dish was also prepared with the meat from an old rooster. After cooking the meat, add tomato, pepper, onion, garlic, potato and spices. Cook until vegetables are tender. Fish and mushrooms were only consumed either by frying or roasting. Vegetables remaining in the fields towards the start of winter were turned into pickles. Pickle water was made with semolina and frequently chickpeas (or a complete grape) to hasten pickling. Of note is the turnip pickle called kyalam. Knead flour and semolina with water and let rest in dark place to ferment. In the meantime, slice the turnips, coat with ample salt, and place in sieve to soak all day to remove bitterness. When the dough has fermented, dissolve in water, and add turnips without washing. It’s ready in a few days. Add seasonings, mint and garlic to the bottom of a wide-mouthed glass jar. Then add vegetables. To prepare pickling solution use 1 vinegar to 2 brine combination. (The brine is made by mixing 60 grams of coarse salt into one liter of water. It is then left to cool). Boil pomegranate juice till slightly thickens (the quantity will almost halve). If desired, you can also dissolve 2 soupspoons of millet flour in water and add to the cooking juice in order to hasten thickening. In this case it is recommended to keep the item in the fridge and quickly consume. To make azokh (sour grape pickle), crush some grapes, pass juice through fine filter, and then cook for a few minutes. Add salt and pour while hot into glass jars. Close tightly and keep in dark, cool place. 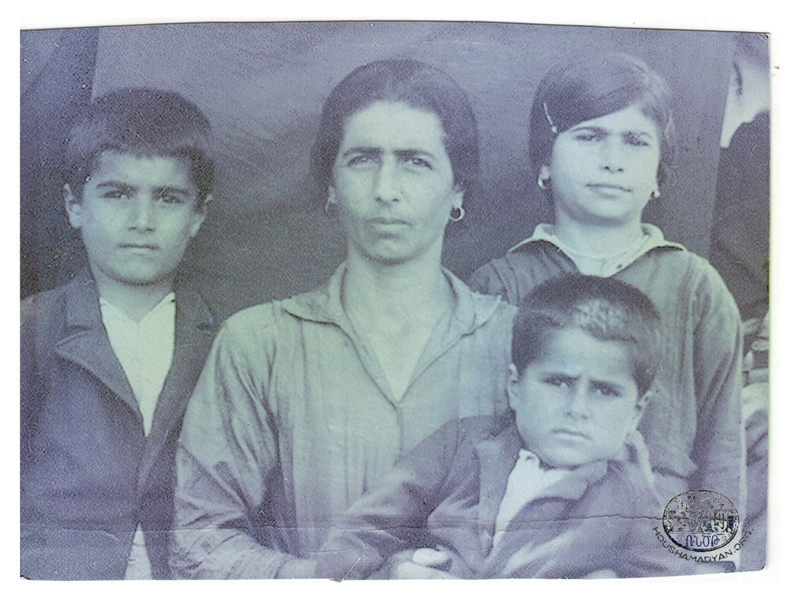 Tovmas Habeshian, Ancestral Echoes of Mousa-Dagh, [in Armenian], Lebanon, 1986. Krikor Kiozalian, Ethnography of Mousa Ler [in Armenian], Yerevan, 2001. Traditional Meals of Mousa Ler and Ayndjar [in Armenian], St. Boghos Church Women’s Guild, Lebanon, 2001. Mardiros Koushakdjian and Boghos Madourian, Memory Book of Mousa Ler [in Armenian], Beirut, 1970. Kr. 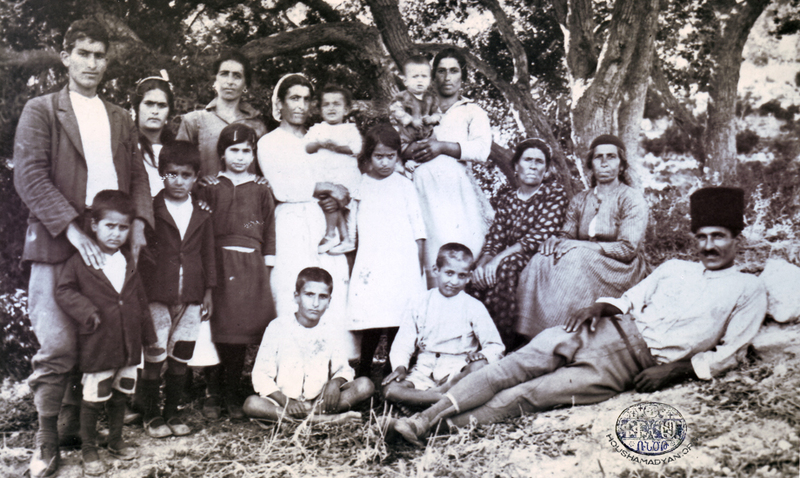 H. Kalousdian, Marash or Kermanig and Heroic Zeytoun [in Armenian], New York, 1934. Sonia Tashjian, Traditional Armenian Kitchen [in Armenian], Yerevan, 2012.